The biggest tree in Burlington is at the corner of Hayward and Howard streets. The most prolific tree in town is the crabapple. The emerald ash borer is not in Vermont yet, but we're surrounded — New Hampshire, New York, Canada. These are just a few of the facts that Elise Schadler dispenses during a Friday afternoon tree walk along the Burlington waterfront. Schadler is a staffer at the Vermont Urban & Community Forestry program, and she's a guest guide for today's tour. 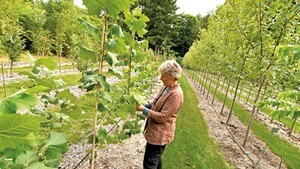 To say she knows her trees would be an understatement — though Schadler admits she's stronger on deciduous than coniferous. Some 20 people have signed up for the event, presented by Burlington Geographic. As part of the PLACE Program (Place-Based Landscape Analysis and Community Engagement), an initiative of UVM and Shelburne Farms, Burlington Geographic "explores the unfolding story of the landscape and community of Burlington, Vermont." This fall it's presenting a series of six lectures on topics ranging from bedrock to edible history to transportation — to, yes, trees. On September 28, program coordinator Sean Beckett and Schadler gave a presentation called "Urban Wilds of the Queen City." Today's workshop follows up on that topic, and Beckett is here to introduce Schadler to the attendees. In turn, she asks them their names and why they've come. The group is varied, ranging from students to professionals to residents who just want to know more about the landscape in which they live. Schadler's primary objective is to show us how to identify trees; during the two-hour walk, she talks leaves, bark, shape, branch attachment, seeds and buds. Along the way, she notes common problems with urban trees: Some are planted too close together, for instance, and some are surrounded by concrete, which compacts the soil and reduces the oxygen. And sometimes, Schadler says disapprovingly, trees are planted too deep. 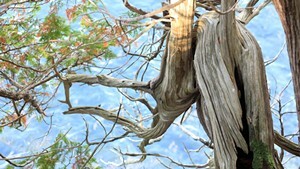 She points to a straight tree trunk that resembles, as she puts it, "a telephone pole." There should be a slight curve in the trunk at the soil line, she instructs. The walk is a lesson in close observation, but Schadler emphasizes the invisible, too. "Ninety percent of issues with urban trees [are] what's happening underground," she declares, referring to roots and the soil around them. As two hours zip by, Schadler gets through only about half of her planned excursion, but the attendees depart with enough tree tutelage for one day. Chatting with Seven Days afterward, Schadler reveals that she's putting down roots of her own. At 33, she's recently married, with what she calls a "dream job," and is "looking to buy a house." At Urban & Community Forestry, she's one of four staffers — all women, she notes — whose role is "technical assistance" on issues and projects relating to trees. She works with "about 50 towns statewide," Schadler says. Just prior to the Burlington Geographic workshop, she spent a day inventorying trees in Charlotte. The assistance UCF provides can involve just about anything that "helps move urban forestry forward," Schadler says. That includes making small grants to towns and organizations, such as Branch Out Burlington! Schadler represents her organization at BOB! 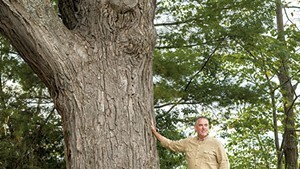 's spring tree plantings and has worked with Warren Spinner, Burlington city arborist and one of 20 UCF council members. She counts him as a friend and mentor: "I have quarterly coffee dates with Warren," she says with a grin. 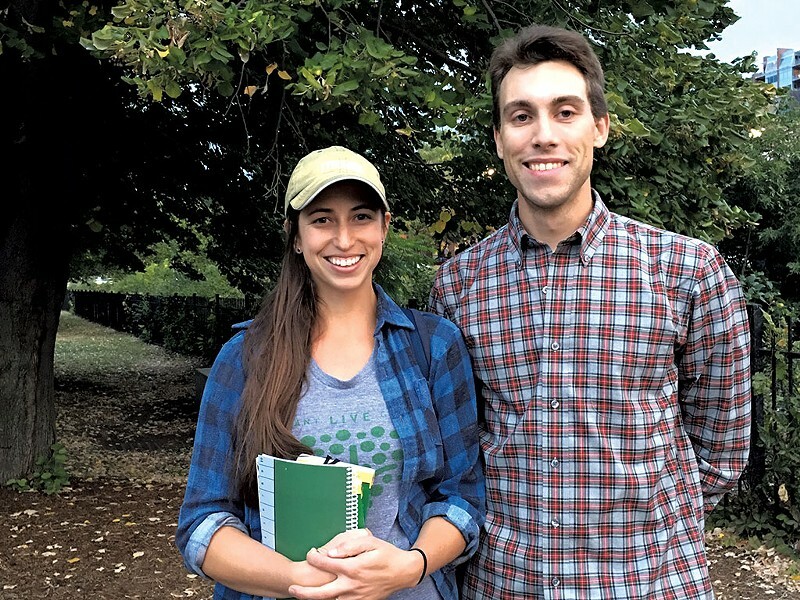 Kentucky-born and Ohio-raised Schadler came to Vermont in 2009 to earn a master's at UVM's Rubenstein School of Environment and Natural Resources. That's what Burlington Geographic's Beckett, 28, is doing now — though his focus is on ecological planning. The Williston native graduated from Vassar College and then worked as a field scientist and a guide in national parks before returning home. The Rubenstein program, he says, "has a great reputation for graduating [students] with a strong ecological foundation." Beckett is particularly interested in communication, education and community engagement — that is, in being a liaison between scientists and all the rest of us. Coordinating Burlington Geographic and working under the PLACE program, directed by UVM ecologist Walter Poleman, serves his desire "to strengthen my naturalist tool kit," as he puts it. "Burlington Geographic is kind of the brand name for the community-engagement work we're doing," Beckett says, and notes that the program's collaborators include Burlington's Parks, Recreation & Waterfront Department, Regional Educational Television Network and Main Street Landing. "Shelburne Farms and UVM helm PLACE, and their sustainability program works with school districts, teachers, educators, in place-based workshops," he adds. The purpose of Burlington Geographic is to engage the nonstudent population, Beckett explains. "This season it's focused on lifelong learning — we're trying to attract people with different interests." The talks and workshops, he says, address issues that residents tend to care about. "It's this idea of connecting people to their landscape," Beckett says. "It helps to make people really rooted to the place they call home." Inviting Schadler to talk about trees and why they're important, he says, makes one of those connections. "She's good friends with Warren Spinner," Beckett notes. "She's at the state level but based in Burlington. In terms of passing the torch regarding tree sustainability, Elise is next in line." The original print version of this article was headlined "Staying in Place"